Welcoming the Mutanimals to the last of the Four Winds, the Path to the East, mystical bird-woman Azrael offers to help them rescue Juntarra if they in turn help her save the Four Winds. 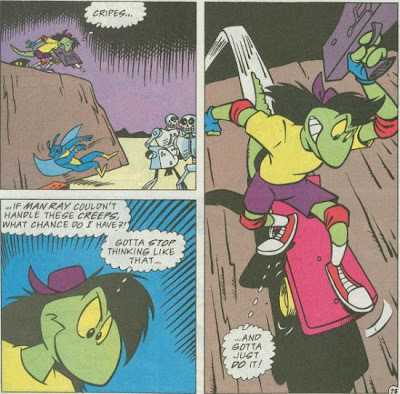 The Mutanimals agree only for Man-Ray to collapse from dehydration. Azrael leads them to a hidden spring where Man-Ray makes a full recovery. She explains that the spring is all that remains of Lake Resurrection and the sacred tropical lowlands of the Path to the East, which were all destroyed by the bad magic of the Grim Reaper and his mysterious cohort. 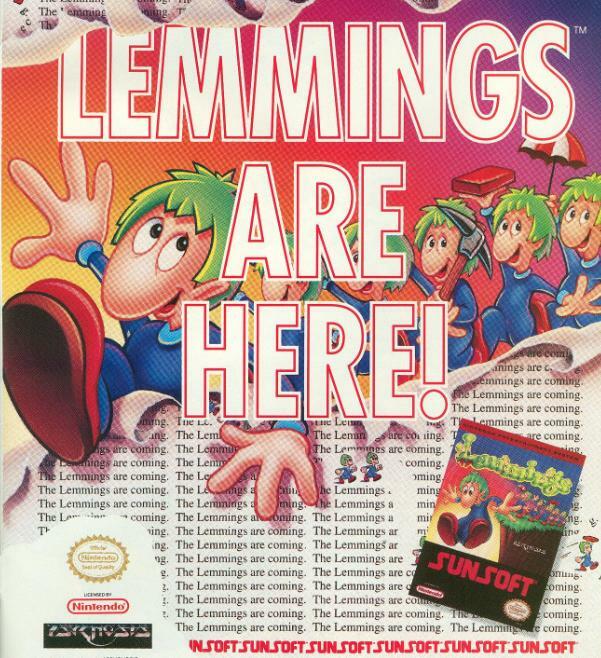 Screwloose grabs his alien rifle and urges everyone to stop yakking and head into battle. Azrael leads the Mutanimals to a hill overlooking the skull temple but encourages Jagwar to wait until nightfall for their assault. Inside, Juntarra wakes up and finds herself bound to a chair with Kid Terra. Kid Terra tells his life story to Juntarra and that Null has captured him for revenge. Reluctantly, Juntarra responds with her life story; that her parents were Spanish missionaries who brought her to Brazil as a child in an attempt to convert Mayorunans. The Mayorunans burned her parents alive but chose to raise her as she was innocent. Juntarra eventually abandoned the Myarunans due to their patriarchal beliefs that women cannot follow the Path of the Four Winds. She then lays the bomb on Kid Terra that she is, in fact, Jagwar’s mother. Night falls and the Mutanimals descend the hill for their assault. Just then, Null steps out of the shadows and greets them… with an army of laser-wielding robot skeletons! The Mutanimals and the skeletons open fire on each other, but the good guys are too badly outnumbered. One by one, they are each taken down until only Leatherhead and Azrael are left. As the skeleton robots move in, Leatherhead tells Azrael to transform back into an eagle and retreat. From his vantage point, Null lights a cigar and grins. *This story is continued from Mighty Mutanimals #4. The story continues in TMNT Adventures #38. *Kid Terra betrayed Null in Mighty Mutanimals (minsieries) #3 and was last seen in Mighty Mutanimals (ongoing) #1. It all makes so much sense, now. Anyway, we’ve reached the last issue leading up to the big three-part crossover arc with TMNT Adventures. If you couldn’t tell from the rather thin summary, not a lot seems to really happen in this issue, but that’s mostly because of the 11-page fight sequence with the skeleton robots at the end taking up so much space. The first four pages also recap the last few pages of the previous issue with the added inner monologue of Man-Ray describing his thirst, so we’re really only given 10 or so pages for the issue's story to progress. But even considering all that, we get lots of exposition explaining the negative impact on the environment that the Grim Reaper and Null have had as well as a deeper look into Juntarra’s past. In fact, I think this is the first time in the entire series that Juntarra has had a chance to speak at length. Her titular “bad attitude” doesn’t make her particularly endearing at first, but the rather shocking amount of violence in her back story kind of leaves her with an excuse to be so surly. Kid Terra’s big comeback is rather underwhelming. Last time we saw him, he was leaving the Mutanimals to try and right the wrongs he had done while working for Null. Apparently, he got captured off-panel between then and now. Still, I like Kid Terra as a character, so I’m pleased to get him back into the story even if the means came pretty much out of nowhere. 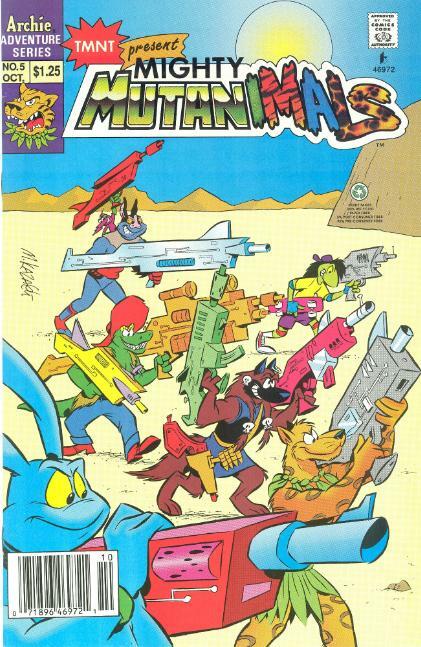 The Mutanimals’ side of things consisted of a big fight scene (and the much-appreciated acknowledgement of the stupidity of a fish trekking through the desert) which, thanks to its extended length of nearly half the issue, allows each Mutanimal a chance to showcase their unique talents and powers in battle. I love how Kazaleh drew the skeleton robots with such goofy faces. It sort of takes the edge off the violence, sure, but it also shows what a grim sense of humor Null has. All in all, while the extended battle was cool, it made this issue a very quick read. 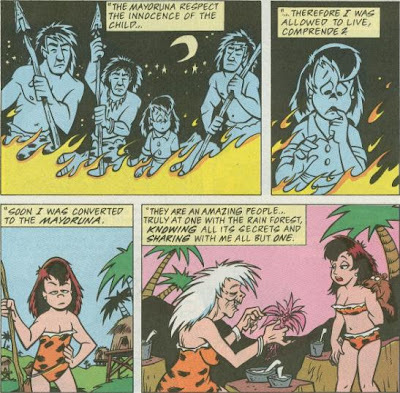 The real meat is in Juntarra’s back story, but even that is delivered through some rather sudden exposition. “Bad Attitudes” is just the last bit of build-up before the three-issue conclusion and sort of feels like its stalling for time. Eric Cartman would not approve of Screwloose's battle tactics. Anyone find it strange that Juntarra would get all mad and leave the Mayorunan tribe on account of their "patriarchal beliefs" as opposed to... oh, I don't know... BURNING HER PARENTS ALIVE??? Kazaleh's portrayal of her young self in that flashback murder scene gives her more of a "oh, this is a tough math problem" vibe as opposed to the "OMG, Mom and Dad, NOOOOO!!!!" feel which one might expect. Anyway, I love how you connect the dots between the Lemmings advertisement and Mondo's appearance. It never hit me until now! Looking forward to your review of the epic crossover!